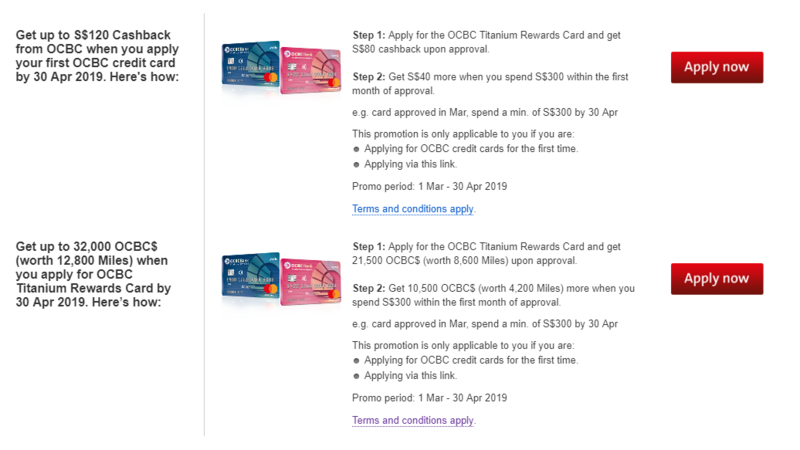 Apply for an OCBC Titanium Rewards card by 18 April 2019 and get approval by 31 May 2019 to qualify. 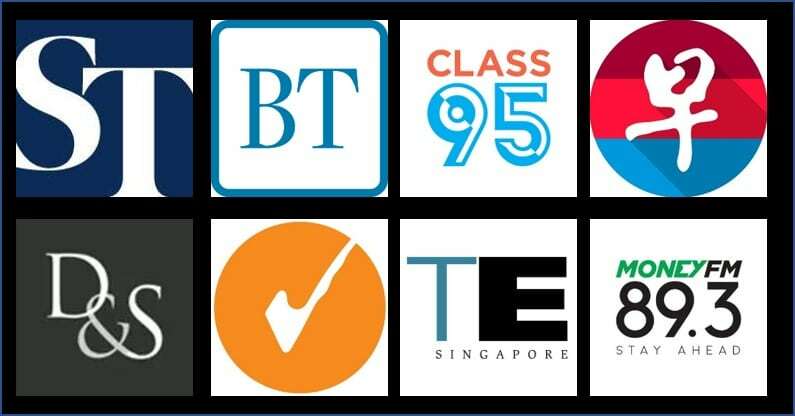 Edit (18 April 2019) : OCBC has extended the sign-ups for this promotion until 30 April 2019! I’ll update the site with the new set of T&C when it becomes available. Back in early March, I wrote about the great offer that OCBC was having for new-to-bank sign-ups for its OCBC Titanium Rewards credit card. Although the promotion was supposed to end on 21 March 2019, it seems that OCBC has extended the sign-up offer until 18 30 April 2019.
an additional 4,200 miles (10,500 OCBC$) by spending S$300 within one month of card approval. The full sets of terms and conditions for the promotion can be found here. For the welcome bonus of 8,600 miles, if your card was approved by OCBC in the month of March 2019, the bonus 8,600 miles will be deposited into your account by end April. If it was approved in April 2019, then the 8,600 miles will be credited to you by end May 2019. If it was approved in May 2019, you will receive the 8,600 miles by end June 2019. For the spending bonus of 4,200 miles, if your card was approved in March 2019 you will have until end April 2019 to spend S$300 on the card. If it was approved in April 2019, you will have until end May 2019 to complete the spending. If it was approved in May 2019, you will have until end June to complete the spending. The additional miles will be deposited into your account by the end of the next month from the month you were supposed to clock the spend in. 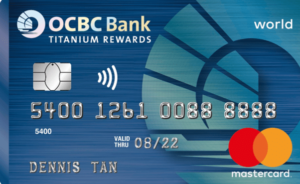 OCBC is actually offering two different sign-up bonuses for the Titanium Rewards card. 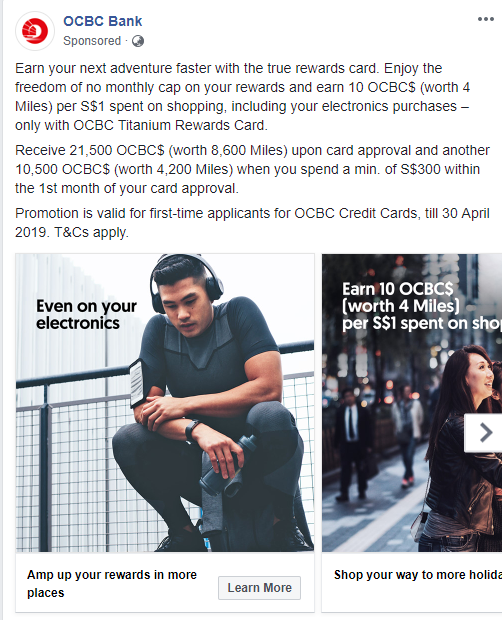 To qualify for the offer which earns miles, you must click on the “Apply Now” button on the OCBC Titanium Rewards landing page which appears beside the text detailing the sign-up bonus to earn miles. Just a reminder that OCBC$ can only be converted to KrisFlyer miles at a ratio of 25,000 OCBC$ to 10,000 KrisFlyer miles with an administrative cost of S$25 per transfer. This sign-up offer by OCBC is one of the more generous sign-up offers that is being offered at the moment. If you have never held an OCBC credit card in your life, or have canceled yours more than 12-months ago, I highly recommend signing up for this card to take advantage of the generous sign-up bonus. If you have never held an OCBC credit card in your life, or have canceled yours more than 12-months ago.. just to clarify if it’s 6 or 12 months? Thanks. Myopia takes it’s toll. Yep it is 6 months! Promotion and re-applied for it under this Promotion are not eligible to participate in this Promotion. Just to clarify, we can only get the bonus miles once correct? Meaning if I am new to bank, and apply for both the blue and the pink card at the same time, I will only be eligible for the bonus miles for one card, correct? 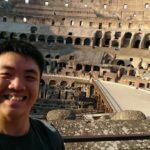 How many first time applicants for OCBC Cards are there? If you applied a card before and cancelled it 3 years ago, you’re still not a first time applicant of OCBC Card. Why they bother extending with such offer conditions? I’e no r/s with OCBC for the last 5 years. Applied and rejected. No reason given. I applied for all other banks recently and got the cards quickly. Don’t know what for they offer this low entry card promo when application is difficult. Btw my credit bureau rating is AA. Is it that your total unsecured credit limit exceed 12 times your monthly salary? will cause his total approved credit limit(*3) to exceed 12 times his monthly income. summed up across all FIs. It doesn’t if it is referring purely to unsecured which excludes home loan. How’s OCBC’s service? Is it as bad as UOB?